Extremely dangerous and potentially deadly, contains toxins that damage or destroy the liver and kidneys. Symptoms: Time of onset 6 to 12 hours (up to 36 hours). Colicky abdominal pain, vomiting, watery diarrhea: symptoms subside after about one day; then about 72 hours post ingestion, gastrointestinal symptoms recur along with signs of impending liver failure. In fatal cases death occurs 7 to 10 days after the first onset of symptoms. Early treatment is essential in Amanita phalloides exposures and poisonings to prevent liver damage and reduce mortality. In most fatal cases patients present themselves for treatment three or four days after ingestion, when symptoms resume following the false remission that occurred about a day after first symptoms appeared. By this time damage to the liver may already be extensive. Silymarin or silibinin is an extract of the Milk Thistle plant, Silybum marianum (L.) Gaertn. ( Asteraceae), that shows promise as a prophalactic measure to protect the liver when administered early in the course of poisoning. This experimental drug is not yet approved for this use in Canada. Description: Medium to somewhat large introduced European mushrooms that grow from the ground near introduced broadleaved trees in urban and suburban environments along the Pacific coast. They often have a rather tall stature. They are found in late summer and fall or rarely in late spring. They make white spore prints. The cap is 5 to 15 cm wide, at first rounded then opening to convex or flattening out to almost plane. Caps usually have a distinct greenish hue, olive yellowish to brownish to olive in the centre, near the edge becoming paler whitish to pale yellowish. The cap is usually bare but when young white flat patches of veil may still be adhering to the surface. The cap is viscid or slippery when wet and moist but in dry conditions develops a distinct satiny or metallic sheen. A very close examination of the edge of the cap’s surface will not show faint radial raised ribs or grooves corresponding to the gills as some other Amanitas have. 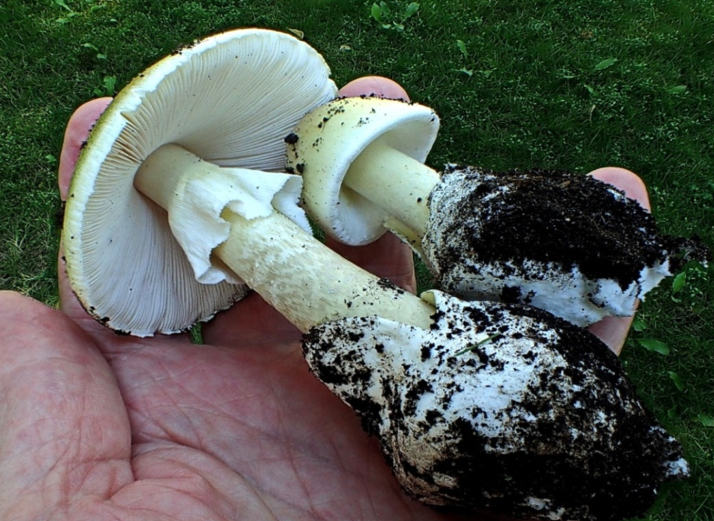 The gills of Death Caps are white, closely spaced and at first covered by a white veil, and are free or not attached to the stem top but rather to the cap underside only. The stems are 5- 15 cm long and 1 – 3 cm wide, tapering slightly upward and expanding at the base to a soft bulb, in the upper portion with a skirt-like hanging membranous veil or annulus that is white and slightly striate to smooth on the inside or upper surface and shaded with cap colour on the lower or under side, the stem is whitish or shaded with cap colour below the veil and white above it. The expanded basal bulb is surrounded by a white membranous sac-like loose to sheathing volva aptly often referred to as the “Death Cup”. Unfortunately, the stem base is often deep in the ground and easily broken off so these diagnostic features are easily missed. Microscopic: Spores are 8.5-9.8 x 6.8-7.8 microns, subglobose to elliptic, smooth, thin-walled and hyaline, amyloid (blue in Melzers iodine solution). Amanita phalloides is the most dangerous mushroom, considered responsible for some 90% of mushroom fatalities around the world. It has spread rapidly since its introduction into the western coastal areas of North America. So far it has been found in BC primarily around the cities of Greater Vancouver and Greater Victoria growing with street trees or in park and institutional landscaping as well as on private properties. Trees with which it is associated in BC are European Beech, Hazelnut, Hornbeams, Lindens, English and red oaks and Sweet chestnut. These are all non-native trees. Recently the death cap has been found associated with a native Garry Oak on Vancouver Island, so they may invade native habitats. So far they have not been associated with conifers in BC or the US Pacific Northwest though in Eastern North America and Europe and elsewhere they are known to live with a variety of conifer species such as pine, fir, hemlock and spruce. It must be stressed that the Death Cap mushrooms are now very prevalent in some urban settings and therefore mushrooms growing in one’s own yard may potentially be deadly. For some inscrutable reason people are frequently impelled to sample mushrooms growing near their homes which they would not try if encountered in a less familiar environment. In August of2003 an adult male in Victoria consumed what he thought were puffballs growing in his front yard. These turned out to have been undeveloped “buttons” of Amanita phalloides; a site visit later discovered several mature Death Cap mushrooms at this location under a mature English Oak tree. The patient recovered after extended hospitalization. 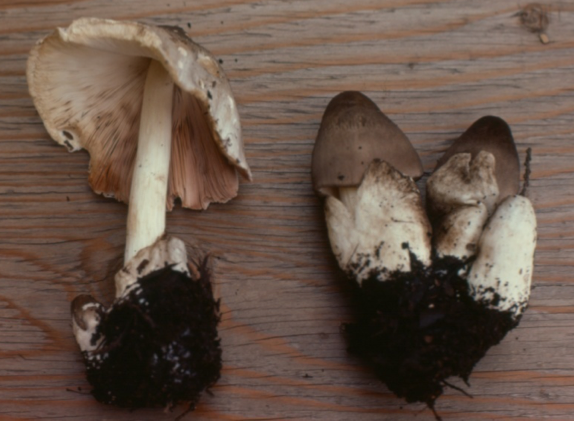 In September of 2008 an adult female ate Death Caps that she had identified as the Straw Mushroom Volvariella volvacea growing on an agricultural property in Langley. After extended hospitalization she recovered. In October of 2016 a three year-old child died more than a week after eating Amanita phalloides growing on a property in Downtown Victoria. Here we present a chronology of Death Cap mushrooms recorded from British Columbia in different areas and with different host trees. Dried voucher specimens are preserved in the UBC Herbarium in Vancouver and in the DAVFP Herbarium in Victoria. 1997 The first Amanita phalloides mushroom in Canada was found at Lake Errock near Mission in the Fraser Valley under a grove of old Sweet Chestnut trees Castanea sativa. Subsequent visits to the site found many more specimens. 1998 Amanita phalloides were found in under an old Beech tree (Fagus sylvatica )at Government House in Victoria on Vancouver Island. 2000 Death Caps were found under Linden trees (Tilia sp.) in Victoria’s Uplands district. 2002 Death Caps were found under Hazelnut (Corylus avellana) in Mission. 2002 Death Caps were found growing under Hornbeam (Carpinus betulus) street trees in Downtown Victoria. 2003 Canada’s first Death Cap poisoning. A man in Victoria ate buttons growing under English Oak (Quercus robur) in his yard believing them to be puffballs. 2006 Amanita phalloides was found growing abundantly under Hazelnut (Corylus avellana) in Surrey. 2008 Vancouver’s first Death Caps were found under Hornbeam (Carpinus betulus) street trees. 2008 Canada’s second Death Cap poisoning. 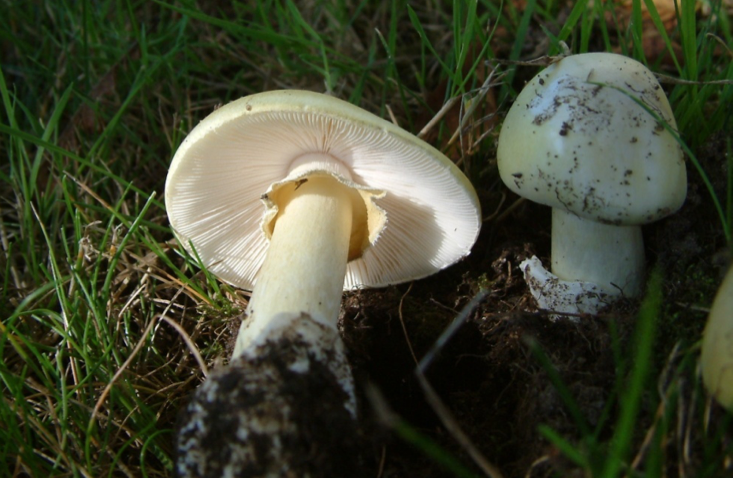 A woman ate young Amanita phalloides gathered on an agricultural property in Langley believing they were Straw mushrooms (Volvariella volvacea). The host tree was not identified. 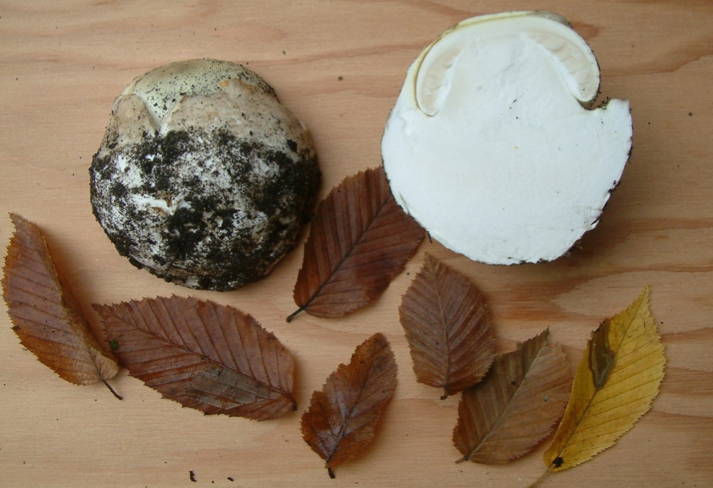 2011 Amanita phalloides was found under Red oak (Quercus rubra) street trees in Vancouver. 2014 Amanita phalloides was found under Hazelnut (Corylus avellana) on Galiano Island. 2014 The Vancouver Mycological Society began a survey of Vancouver street trees for Amanita phalloides. Eventually more than 75 host trees were located, just about all of them were Hornbeams apparently planted in the 1960s and early 1970s, or 45 to 55 years ago. 2015 Amanita phalloides was found growing with a native Garry oak (Quercus garryana) in remnant woodland near Victoria. This is the first record of the Death Cap growing with a native tree in BC. 2015 Amanita phalloides grew under a European Beech (Fagus sylvatica) street tree in Vancouver. 2016 Amanita phalloides grew under English oak (Quercus robur) in Vancouver. 2016 Canada’s third Death Cap poisoning and first Death Cap fatality. 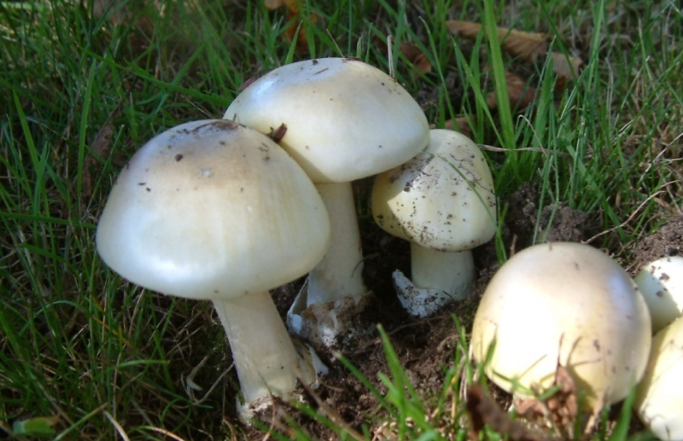 A three year-old child died after eating Amanita phalloides which grew under Hornbeam (Carpinus betulus) trees in downtown Victoria. Berch, Shannon M., Paul Kroeger & Terrie Finston 2017 The Death Cap mushroom (Amanita phalloides) moves to a native tree in Victoria, British Columbia. CJB in press. Lincoff, Gary and D.H.Mitchel 1977. Toxic and Hallucinogenic Mushroom Poisoning: A Handbook for Physicians and Mushroom Hunters. Van Nostrand Reinhold Co.